Mary Poppins used hers as a mode of transportation. Queen Elizabeth uses hers to make a fashion statement. But most of us just use umbrellas to protect ourselves from the elements. Yet, one search of #umbrellafail on Instagram shows just how flimsy most umbrellas can be. It's sad. As a travel writer, I've bought countless umbrellas from street vendors over the years. Most lasted until the first gust of wind. And some survived gust No. 1 only to completely invert and break come gust two. 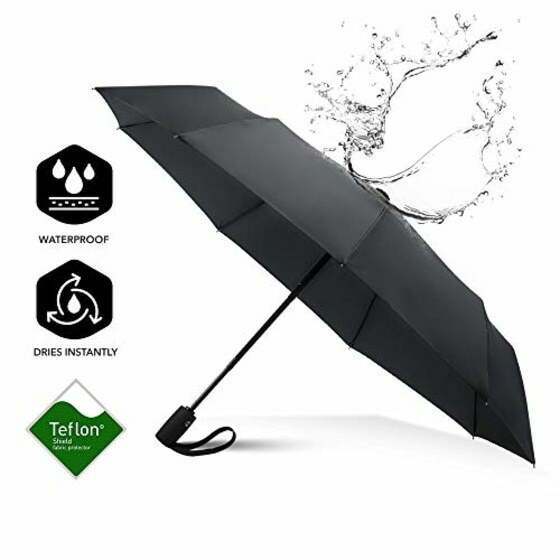 It's taken me too long to realize a quality umbrella is just as important of an investment as a great raincoat or a good pair of rain boots. Fortunately, just in time for my latest trip, I discovered the Repel windproof travel umbrella. Most umbrellas from street vendors cost only $10. Truth be told, though, if an umbrella's life span is only a few storms, the cost of keeping dry can quickly add up. I'd never spent $24 on an umbrella before. 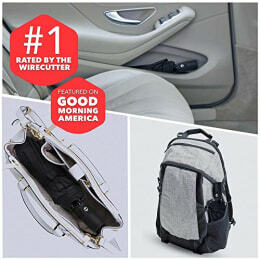 However, it was easy to do once I saw the Repel's 4.4-star rating from nearly 6,000 reviews. It's also Amazon's best-selling folding umbrella, and the lifetime replacement guarantee was too great to ignore. If your Repel windproof travel umbrella breaks at any time, the company will send you a new one for free. You don't even need to send in the broken umbrella. In my experience, rain doesn't ruin umbrellas. Wind does. So when I recently packed for a trip to El Medano, a beautiful, windy beach town in Spain that hosts the Professional Windsurfers Association World Cup, I figured it would be the perfect place to test my new umbrella. Packing it was a breeze, pun intended. It's only 11.5 inches long and 14 ounces. Then, the day I used my Repel windproof travel umbrella in El Medano, the wind was averaging 18 mph. Still, my umbrella performed remarkably. Disclaimer: Strong gusts can cause this umbrella's canopy to turn inside out. However, thanks to the umbrella's "wind-defying nine-rib construction" the framework doesn't break. Most umbrellas this size feature only six to eight ribs. And they're usually aluminum. 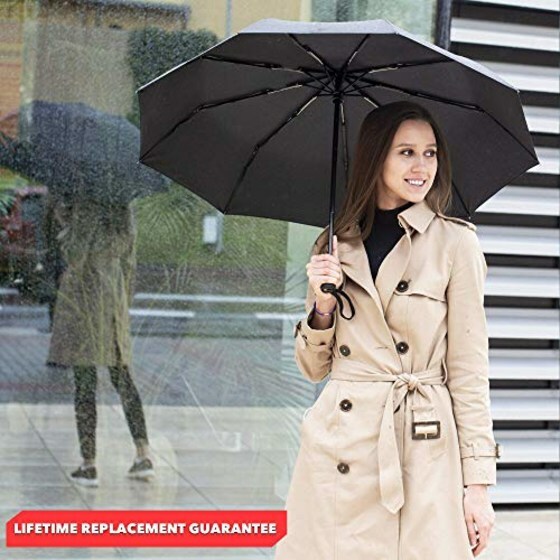 Not only does this umbrella have an extra rib, or three, but each one is reinforced with fiberglass. So all I had to do the one time my umbrella canopy inverted was pop it back out. Furthermore, the teflon prevents any water from pooling and makes the umbrella easier to shake off. Instead of the normal five or six shakes it takes to get all the water off, this one requires just one. Sure, Mary Poppins' umbrella had a cool parrot head handle. But in the midst of a surprise downpour, or needing to board a bus with a line of people behind you, novelty means nothing. A second or two means everything. 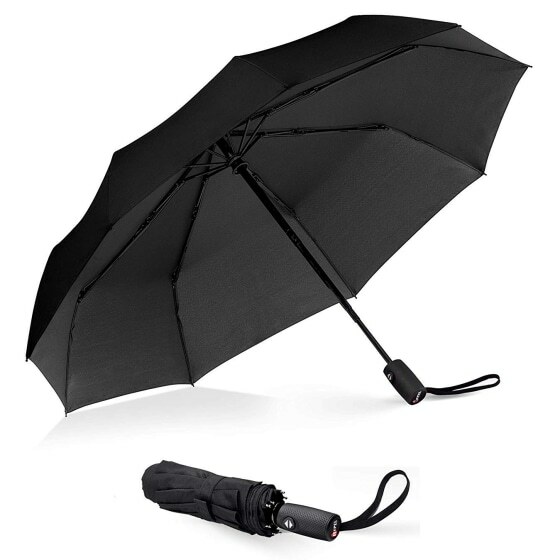 That's why I love that this umbrella's handle has a button that quickly opens and closes the canopy. I'm also finding that I don't need to fight it to get it back into its travel sleeve. Since it does such a good job of staying dry, it slips in easily. Even if I had this umbrella in all six colors, I'd never be able to compete with Queen Elizabeth's stylish collection. And unlike Mary Poppins' magic umbrella, the closest this one will ever get to flying is soaring on a plane inside my luggage. Still, when it comes to staying dry in even the windiest of conditions, I feel confident with the Repel windproof travel umbrella in my hand. It's worth it.